An unimaginable reservoir of creative potential constantly surrounds you. to birth it into the world. as you determine which of your beliefs will spark the universe to rush forward. IAM the oyster shell in which you create the pearl. 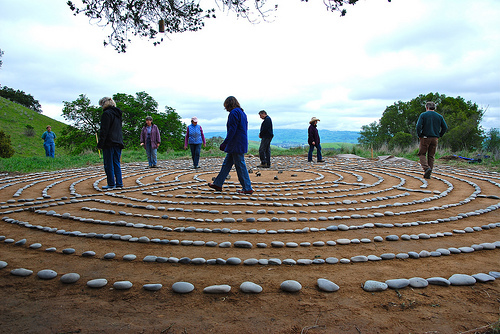 Several years ago I was walking the labyrinth at the Institute of Noetic Sciences in Petaluma, California. At that time I was serving on the board of Directors of Veriditas~ The Worldwide Labyrinth Movement. My 3 years working alongside Rev. Dr. Lauren Artress and a group of 11 devoted board members was very rewarding for me. As a board, we always walked the labyrinth together & the synergy of that group often magnified my walks, loosening powerful images and insights which would bubble to the surface before I exited. The labyrinth at IONS is created with stones which outline the 12 circuits leading to its center. It was along one of those paths that a repeating message began to emerge. A message that soon exploded into hundreds of metaphors…….. This entry was posted in Emerging Soul Cards and tagged Creativity, ignite potential, IONS, Labyrinth, potential, Veriditas on May 24, 2015 by Rebecca Winters Rodriguez.